Smutty is very concerned for all the pets in the path of hurricane Irene. 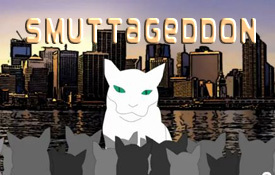 Smutty remembers all the pets displaced or hurt or died during Katrina. Please humans, have a safety plan that includes your furry family members. When the wind dies down, you will want to know they are still safe too. Smutty’s prayers are with you; God bless all those affected by this storm, including the furry people. OK, Smutty understands humans’ fascination with space, but if you are going into space for a $1 million dollar vacation, who is watching your pet? Hotels have started to provide facilities for humans with pets, so any new type of destination vacation should be prepared to offer pets, especially cats, accommodations. Many families have to consider their pet’s needs when traveling. Pet sitters are difficult to find and require background checks. For the same expense, the family can enjoy the company of their four-legged friends and know they are being well taken care of. So, as more companies jump into the “space vacation” business, please keep in mind the comfort of the furry family members. Just don’t try scrambling my molecules through a transporter. Yawn.